Gutter guards help to keep your water drainage system clear and will prevent damages due to backed up gutters from occurring at your home in Cedar Rapids, Dubuque, or any other nearby area in Iowa. If you’re searching for a home improvement company you can trust to install a high-quality product, turn to Waddle Exteriors. 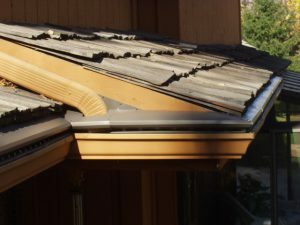 We install Gutter Topper gutter guards, which utilize the forces of gravity and surface tension, as well as their rounded-nose design, to pull water directly into your gutters while all debris falls to the ground. Our gutter covers can also withstand winds of up to 110 mph and can hold weights of up to 1,200 pounds per square foot. That means, with our gutter protection products, your water drainage system will perform perfectly throughout the year, and you’ll never have to climb a ladder again to clean your gutters. For more information about the Gutter Topper gutter guards we can install on your home in Cedar Rapids, Dubuque, IA, or any of the surrounding communities, contact Waddle Exteriors today.